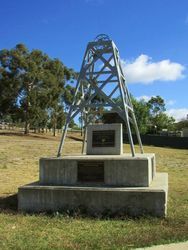 Long Gully Mining Monument was erected in appreciation of Bendigo's underground mining and acknowledges the contribution of miners who lost their lives in the industry to accident and industrial disease. The discovery of alluvial gold by Mrs Margaret Kennedy in the Bendigo Creek in 1851 soon saw the word 'Gold' become synonymous with Bendigo. 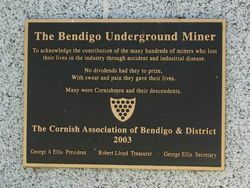 During Christmas in 1851 there were 800 people on the Bendigo field, by the following June 20,000 diggers had arrived. The diggers travelled from all over the world and risked everything to make a living (and, if they were lucky, a fortune) from gold mining in Bendigo. Margaret Kennedy's discovery sparked a gold rush that would leave Bendigo with a history of being one of the richest producers of gold in the world, yielding over 700,000kg between 1851-1954 (which would be worth about $30 billion in today's prices). Bendigo was literally built on gold and is still known today as 'Dai Gum San' or 'Big Gold Mountain' by the Chinese. To acknowledge the contribution of the many hundreds of miners who lost their lives in the industry through accident and industrial disease. With sweat and pain they gave their lives. The economy it created changed Bendigo from a mining town to a beautiful city. 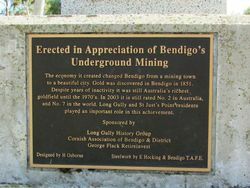 Gold was discovered in Bendigo in 1851. 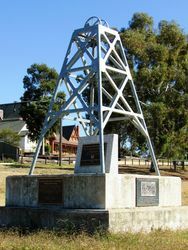 Despite years of inactivity it was still Australia's richest goldfield the 1970`s. In 2003 it is still rated No. 2 in Australia and No. 7 in the world. Long Gully and St. Just's Point residents played an important role in this achievement. Designed by H Osborne Steelwork by E Hocking & Bendigo T.A.F.E.